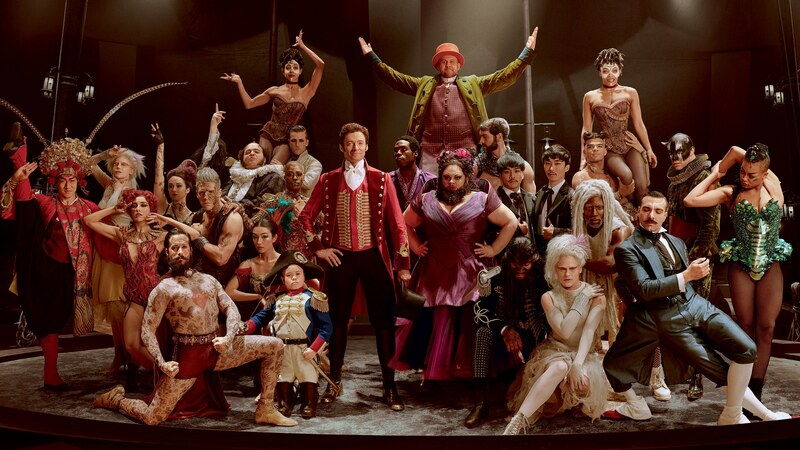 With the help of trust fund investor Phillip Carlyle (Zac Efron), Barnum’s “circus” (as it’s dubbed by Paul Sparks’ sceptical theatre critic) becomes a financial success, but Barnum craves respectability, so he gambles everything on a promotional tour of America with European opera singer Jenny Lind (Rebecca Ferguson). Scripted by Jenny Bicks and Bill Condon, the film holds Barnum up as the inventor of show business and a champion of diversity (“Every one of us is special, and nobody is like anyone else”, is his recruitment line), though the reality is that Barnum was a master of exploitation who made a career out of hood-winking the American public. (To be fair, in that context, the invention of showbusiness claim still holds). The film doesn’t exactly shy away from the deception angle, but it’s heavily sanitised and the only real examples we see are Barnum adding padding to the World’s Fattest Man and giving the “Irish” (actually Russian) Giant a pair of stilts. The other main problem with the film is that there’s very little in the way of dramatic conflict, other than a few tussles with bigoted, “freak”-hating by-standers and Barnum’s obvious infatuation with Lind, which nearly destroys his marriage, though the playing-it-safe script never actually admits that he had feelings for her. Having said that, if you can get past the film’s tendency to air-brush the truth, there’s a lot to enjoy here. Gracey directs with high energy, in a manner that suggests he’s watched Baz Luhrmann’s Moulin Rouge more times than can be considered healthy, and Jackman is terrific as Barnum, putting his infectious charisma to strong use and sparking palpable chemistry with Williams, Ferguson and Efron. Similarly, Efron is effortlessly charming as Carlyle (High School Musical fans will get a big kick out of seeing him singing and dancing again) and his forbidden romance with Zendaya’s character forms the film’s most engaging sub-plot, to the point where you wish the filmmakers had devoted more space to it. In addition, the musical numbers are attractively staged, with significant contributions from cinematographer Seamus McGarvey, production designer Nathan Crowley and costumer Ellen Mirojnick. There are a couple of stand-out moments, but the highlight is “Rewrite the Stars”, a delightful duet between Efron and Zendaya that involves some crowd-pleasing trickery with a dangling rope. As for the rest of the songs (by La La Land lyricists Benj Pasek and Justin Paul), they’re best described as catchy, samey and largely forgettable, though a show-stopping, loud-and-proud number about celebrating your uniqueness (“This is Me”) is certain to become a staple on the likes of X-Factor in the very near future. Matthew turner is a freelance film critic and broadcaster. The Greatest Showman is out on Boxing Day.